[ONE RUBIKS CUBE -TWO PLAY WAYS] Newest Innovative Coolest play idea combined two hottest toys together - 1x3x3 rubik\'s cube and fidget spinner. You can not only twist and solve it as a rubik\'s cube 1 by 3 like a brain teaser toy, but also can flick and spin it as a fidget cube toy to relieve stress & anxiety for who has ADD, ADHD, OCD, Anxiety Disorder, Autism. The rubik\'s cube spinner has new great design, bright colour appearance, super fault-tolerance great craftwork. [PERFECT CLASSICAL HAND FIDGET TOY PRESENT] The rubiks cube spinner toy is, FOR all people-adults & children / friends & kids & classmates; FOR all places-at home & work & school;FOR all time- family party & car or train travel & afterclass & bedtime & doctor appointment and etc; FOR all festivals to prepare presents-Birthday & Christmas & New Year & Children\'s day & Easter & Halloween & Thanksgiving and etc. ; Pocket Size-small & lightweight & easy to carry anywhere. [LONG SPINNING TIME] Up to 100s spinning time. ANTI-POP structure: the stable cross shaft and cube corners make it stable, non-detachable and no getting stuck, also can bear high fall and won\'t fall apart; The Anti-VISCOUS groove design on cube corners effectively prevents the Rubics cubes from viscosity when rotating it rapidly; Large rounded corners and corner cutting curved edge optimize Rubik\'s cube fault tolerance, ensure play it super fast, smoothly. [INVIRONMENTAL RECYCLABLE MATERIAL EXCELLENT TEXTURE] Made with original POM ABS material and other high quality environmental plastic, which means no fading, peeling or poisonous. It has smooth touching feeling and edges; No STICKER - smooth design means the cubes color won\'t get faded over time to keep always new to have a better hand play feel, no scratchs and fingerprints left, no reflections to protect eyes, no sticker fall off. 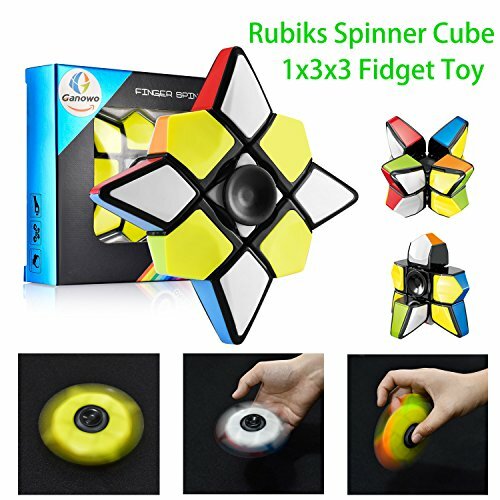 Get this cost-effective rubik\'s spinner at once! [COOL GIFT IDEA with GREAT CUSTOMER SERVICE] FULL MONEY BACK GUARANTEE - Don\'t worry, we provide satisfied guarantee if you don\'t like it. This 2 in 1 rubiks fidget spinner toy can train our imagination, observation, concentration, inspire unlimited intelligence, also improve independent hands-on ability for kids, keep us away from electronic products for while. You can also solve the speed cube spinner with your kids together to have fun in your family time. Bonding time with my grandson!